Earlier in the summer, I was delighted to learn about a new book about divorce. The book was called Pathways to Amicable Divorce, and it was written by Family Law Mediator, Christina Vinters. At the time, the book was being offered for free as part of a launch promotion, so I quickly clicked and added it to my digital library. As you probably know, I’m highly passionate about productive, mindful, respectful (amicable) divorce processes. I’ve read a lot of books about divorce, and they can be a bit clinical (really boring), especially the how-to guides. But Pathways to Amicable Divorce was different. It was simple and succinct. Truly, an easy read. Deeper into the book, readers receive an overview of the process as well as lessons in cooperative alternatives. One thing I was delighted to see was the inclusion of “kitchen table negotiation” as a process for reaching an amicable agreement (Chapter 5). The number one key in having an amicable divorce is for exes to talk to each other, and encouraging them to connect one-on-one is priceless. After all, the relationship doesn’t end with a divorce decree. Coparents will have to communicate in some way for as long as they share children. While I was hooked on the book from the beginning, the suggestion that STBXs speak to each other without a professional middleman impressed me to no end. Soon after I finished Pathways to Amicable Divorce, I asked Christina if she’d be willing to record an interview with me and she said yes. Check out our chat below to hear more about the book and Christina’s work as a mediator. I’m grateful to Christina Vinters for sharing her wisdom with the masses. Her experience as an attorney, combined with her intentions as a human have come together in a easy-to-read, inspirational companion for healthy progress. And I was delighted to read, at the end of her book, that she’d made the choice to focus fully on productive processes instead of litigation. Countless families stand to benefit from her work. 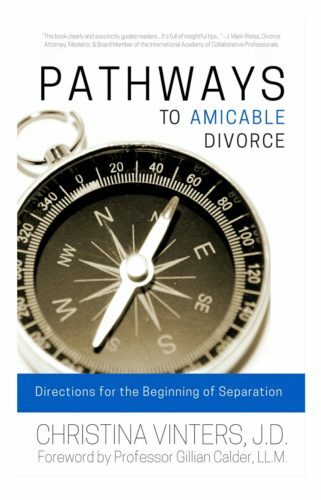 Pathways to Amicable Divorce is available on Amazon. And you can learn more about Christina on her web site, VintersMediation.com. Posted in children of divorce, divorce, family and tagged christina vinters, divorce, interview, mediation, pathways to amicable divorce.